No matter how many years you’ve been painting -, there are still steps a graffiti writer & artist need to follow to use spray paint as efficiently as possible. Even with experience and repetition, there’s always something that gets left behind or one forgets. As a simple primer we put together a quick reminder of some spray painting basics (some way more obvious than others) that every writer and artist should keep in mind. Consider this article a “graffiti writing for dummies” type basic overview to help newbies and old pros minimize problems that might arise while doing graffiti, street art and murals - but especially if you’re painting something quick. We’re starting with the most obvious spray paint error. That being said, you would be surprised how many times well known writers and friends often forget to shake their spray cans before use. Such a simple task that can relieve so many artist headaches, yet is often overlooked, especially on occasions when doing spontaneous, quick graffiti. As a rule of thumb, just plan on drilling it into your brain to shake your cans at home right before you plan to use them. Whether you are painting graffiti, street art or commissioned murals, shake each of your spray cans for at least 15 seconds after hearing the sound of the mixing bearing. This practice will make sure that the paint inside your spray cans is at least initially mixed by the time you need it, and if painting graffitis, you aren’t losing youropportunity due to shaking spray cans on location. If you happen notice that the spray can mixing bearing seems stuck inside, you can knock it loose by using another spray can as a hammer and hitting the bottoms together. Don’t use all of your strength or you’ll have an even bigger, much messier problem to deal with. Finally, if you have nosy neighbors, who be alerted about your painting graffiti by the spray can shaking at home, you can wrap the cans with pillows in order to mix them silently. Another option for a quieter spray can shake, is to utilize a Montana Colors Mute on cans with metal mixing bearings. The MTN mute is a small powerful magnet which will keep the bearing from hitting the metal can. The downside, is it means you will be shaking your spray cans longer since the bearing is not helping the mixing process. Don’t Forget Your Painting Gloves! When painting, who hasn’t forgotten gloves and had to ask for them? To avoid this from happening repeatedly, a simple solution is to store your painting gloves in the same places as your spray cans. To make it even easier you can break out sets of gloves in ziplock bags so they are easy to grab and ready to go. This also eliminates carrying the entire box of gloves around or dropping a random glove here or there. Never wear nitrite or latex gloves if you have to jump fences before painting. Put them on right before you start to paint in this case. Put on your gloves as soon as possible if you have to move around really dirty areas. Nylon and polyurethane gloves are compatible with the two previous scenarios. If you recycle gloves, make sure you store them in their original position. If not, you could end up with paint from the previous use stuck to your skin. Finally, when using latex gloves keep in mind that they can break easier due to their reaction with sweat over longer periods of use. Before you use spray paint on your chosen surface, it is always recommended spraying out of the can a bit in the air or on a trial surface until you see the paint come out. If you forget to test spray, it is possible the solvent that is currently backed up in the inner tube of the spray can will be released, causing the paint on the surface to run, in turn extending the dry time significantly. 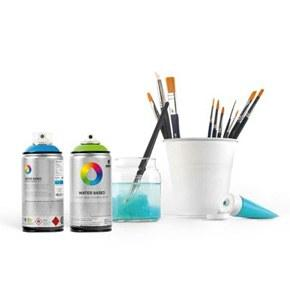 With large sized spray paint cans like Montana Colors Mega or MTN MAXIMO, this error can be disastrous given the large amount of solvent those spray cans can often release initially. Note: Before doing this test spray, don’t forget to keep the direction of the wind in mind to avoid the paint mist from coming back at you. If it's going to be a while before you use your aerosol spray cans again, don’t forget to purge the valve and cap. This is simply done by holding the can upside down and spraying through the spray cap until paint ceases to be released (it will spray clear at that point). Although this technique is not perfect, it’s the best method for avoiding the spray can caps from getting clogged, or at the very least extending the life of your spray can caps. Because spray paint can be a bit bulky and get heavy in any quantity, it is always hard to figure out the best ways to transport your cans. If you want to transport your cans in the safest way possible, it’s best to try and keep them situated in an upright position. If you are trying to be stealthy, keep in mind that full spray cans make less noise than emptier spray cans. We suggest the following ways to best transport your cans to your next graffiti, street art or mural project to minimize accidental spraying and ease of carrying. A 6-Pack box can actually fit 8 spray cans! Simply place two spray cans horizontal at the bottom of the box (without tips) and then place 6 spray cans upright on top of the two horizontal spray cans. Cardboard boxes work well, just make sure that it isn’t going to rain! The downfall of using six pack boxes or any cardboard is that they start to fall apart when wet. If your spray cans come with lids/covers, try to keep track of them, as they provide extra protection and help identify colors more easily. If you lose a lid, just make sure you pull your spray tips / spray caps off the spray paint before packing for transport. Milk Crates are key! If you have access to plastic or metal milk crates, these are one of the best ways to transport spray paint in bulk. Not only are the milk crates sturdy you can usually fit around 24 or more spray cans in one crate! Again, just make sure that your spray nozzles are pulled off the spray paint before packing! Re-usable Shopping Bags are great for spray paint too! In this day and age we are all used to seeing reusable shopping bags at grocery stores. While they are designed to be able to carry heavy grocery loads, this design also makes them perfect for carrying 6-12 full spray cans. Not only are they durable and don’t fall apart in water, but because they look like grocery bags, they are pretty inconspicuous as you walk down the street. Backpacks work well, but can be costly. The old mainstay of many graffiti artists and writers is the backpack. You can throw 12-18 spray cans in it (with spray caps off of course), zip it up and toss it on your back with ease. While brands like Jansport offer lower cost back pack options, they still cost $18 and up, and really, the cheaper options aren’t able to take heavy abuse and tend to fall apart. If you prefer the backpack option, we suggest something more heavy duty like a military grade pack – yes it costs a bit more, but if you plan to use it for a long time, that investment will pay off. Use the MTN Ninja in order to go out with your favorite clothes on, without putting them at risk. Turn your clothes inside out. That way, any possible stains won’t be visible when you wear them the right way out. Specifically, to keep your shoes clean, put plastic bags on them. In some cases, you might have a favorite T-shirt on when catching a spot or just forgot to change out of it. If you happen to get a stain on it, a quick solution is to repaint the stains with a color that's closest to the garment’s color to try to hide the mark. Painting is a tough and dirty activity by its nature, no matter if you paint graffiti, street art, mural art or keep it in the studio. From lugging spray paint around, to breathing in paint fumes to maintaining your spray equipment, there are any number of things you can forget that could cost ya in the end. Hopefully this first set of tips will be a friendly reminder. Keep an eye out for next part of this series!